I wanted a quick and simple card design and this does it. Color blocking the Designer Paper and using it as the focal point makes for a sweet and simple card. 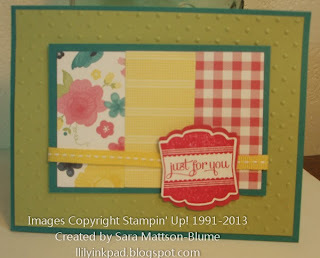 The Gingham Garden Designer Series Paper has bright, cheery colors! The Artisan Label Punch adds sweet detail, I just cut one in half and then layered it behind the stamped image.